The iPhone6 is born after so much of a wait. After numerous leaks and rumours, Apple’s latest smartphone has been unveiled ahead of a September 19 release date. The Samsung Galaxy S5 not a solo rival. The two brothers launched same day, iPhone 6 runs a 4.7-inch display, the 6 Plus packs 5.5-inch screen. Adding cherry to pie, iPhone6 is sharing the stage with Apple’s first wearable. The Apple Watch will not hit stores until ‘early 2015’ but is still been seen as rage over rivals such as the Samsung Gear Live and Motorola’s Moto 360. Keeping with Apple™ custom, the September 19 iPhone 6 release date will see the phone hit 10 territories. Countries such as the UK, US, Australia, Canada and France next week will get first hands and Germany, Hong Kong, Japan, Puerto Rico and Singapore will also follow the suite. Apple has reaffirmed that both the iPhone 6 and iPhone 6 Plus will be available in 115 countries by the end of the year. Kindly note who can’t wait, Apple has stated that iPhone 6 pre-orders will open this Friday, September 12. iPhone 6 Plus pre-orders will be held at the same time. We have been great fans of Apple™ products ourselves. Visually, the iPhone 6 is a whole new avatar. It lean, slimmer than its predecessor, the phone is blessed with refined, rounded edged design. Thickness for iPhone 6 is just 6.9mm thin, the iPhone 6 Plus is a slightly burlier 7.1mm thick compared to the 7.6mm iPhone 5S. The iPhone 6 weighs about 129g while the 6 Plus weighs 172g. Upfront the iPhone 6 looks totally different. The phone’s rounded corner look has been polished with an anodized aluminum back. The Apple logo is made from a stainless steel tile. Available in three iPhone 6 colours i.e. silver, space grey and gold hues. iPhone 6 Plus too comes in same options. The iPhone 6 isn’t just about looks. The phone features improvements under the hood, too. Up first, display. While the phone was supposed to features a Quantum Dot display coated in scratch resistant Sapphire Glass, instead the iPhone 6 packs a 4.7-inch LCD Retina HD display with an Ion-strengthened glass layer. On screen resolution perspective, while the traditional iPhone 6 bears a 1334 x 750 pixels resolution, the 5.5-inch iPhone 6 Plus comes with a 1920 x 1080p Full HD panel. Displays offer fingerprint-resistant oleophoblic coatings, wide viewing angles and 500 candela brightness levels. Things have been rejigged beneath the surface too. Processors: The iPhone 6 is the first Apple phone to run the new 64-bit A8 processor which makes it 13 per cent smaller than last year’s A7 chip and offers 25 per cent faster processing speed. 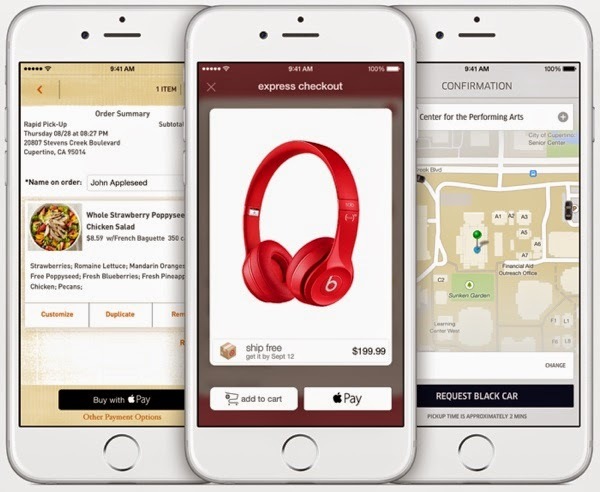 The iPhone 6 will now offer biometric authentication on third-party apps and will also come in handy when using Apple’s new in-store mobile payment service, Apple Pay. Battery: Apple is claiming the iPhone 6 offers staying power equal, if not better than, the iPhone 5S i.e. it shall offer 14 hours of 3G talk time while the iPhone 6 Plus will run 24 hours of 3G talk time on a single charge. Storage: Now let’s focus on storage with usually microSD card expansion missing as always, the company has confirmed it will introduce a 128GB iPhone for the first time and the phone will be available in 16GB, 64GB and 128GB capacities. Connectivity: The iPhone 6 is 4G, LTE compatible which supports 20 LTE bands, and will also offer Voice over LTE (VoLTE) and Wi-Fi calling too. For the first time on an Apple phone, NFC has made the cut. Accessories: The phone will come with a pair of Apple EarPods headphones, and a Lightning charger. The handset work with a Nano-SIM only like earlier versions. 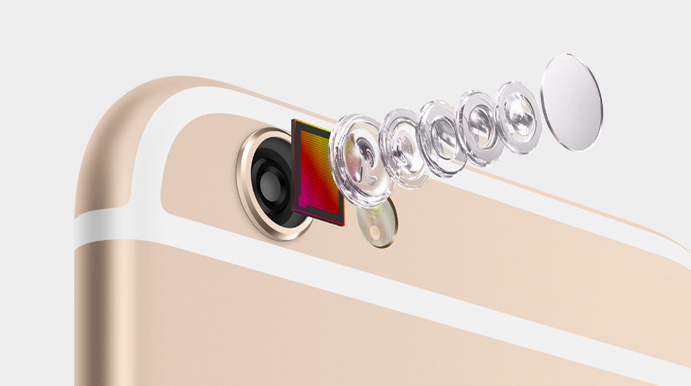 Camera: The phone features the 8-megapixel iSight sensor with a TrueTone flash and a f/2.2 aperture. The camera has a new autofocus mechanic which is faster and more accurate than on previous models. Focus Pixels used for phase detection focusing is also one of the new features. The usual array of all-encompassing camera modes on both devices. Panorama shots have also been boosted to up to 43-megapixel in size which is incredible. The iPhone 6 is capable of shooting 1080p, Full HD video at both 30fps and 60fps. Apple’s Slo-Mo mode makes a welcome reappearance with footage able to be captured at 240fps before being slowed down. A new 1.2-megapixel FaceTime HD camera features around front which boasts a f/2.2 aperture and can shoot 720p HD video that truly impresses in Video-calling. Operating System: The new phones run out of the box on iOs 8 which addresses ease of use, and introduces an improved Notifications menu, as well as Mail improvements and new Safari features. The software brings HealthKit and HomeKit to the fore for the first time which are set to collate data from all manner of third-party devices to offer a comprehensive understanding of your most intimate data in one location. As with most things Apple, the iPhone 6 isn’t inexpensive. Prices for the phone starts at a premium £539 for the 16GB model. 64GB and 128GB capability handsets will come at £619 and £699 respectively, the larger iPhone 6 Plus will be even more expensive. The three storage options on the 5.5-inch handset will be priced at £619, £699 and a whopping £789.